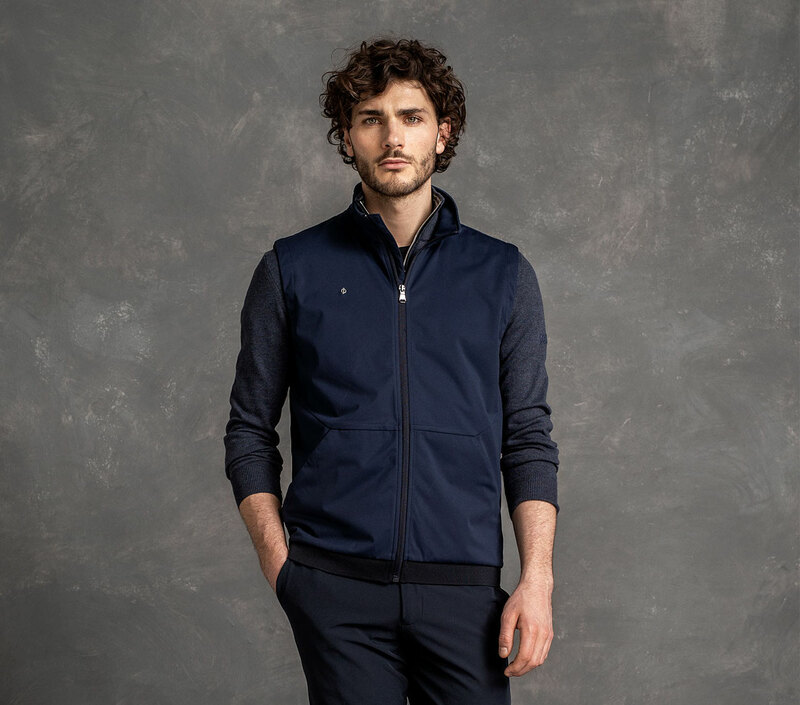 With a focus on uncompromised quality in design and fabrics, Oscar Jacobson’s Spring/Summer 19 golf collection showcases the company’s skill in producing menswear of the highest quality. The collection features stylish, performance garments delivering fashion and function.The SS19 collection – presented in Forces Blue, Maroon, Green and Red colour themes – draws heavily on the brand’s expertise in fashion tailoring, and its unparalleled knowledge of technical golf apparel.The SS19 golf collection demonstrates Ocar Jacobson’s design philosophy based on Scandinavian simplicity, combined with inspiration from Italian tailoring and the British textile tradition. On cooler days when another layer is required, the Waldorf mélange sweater will sit elegantly over the top of any of these stylish polo shirts. Woven in Italy from luxurious Egyptian cotton, Waldorf boasts a half-zip design with metal logo on the chest. Also in 100% Giza Egyptian cotton, the Bob, sleeveless zipped sweater is lightweight and very soft to the touch.The Hawkes zip-neck jersey and Hoff zip-neck sleeveless jersey both deliver comfort and a modern fit that allows for excellent freedom of movement through the swing. The Rast, round neck sweater delivers fashion detailing with contrast sleeves while the T-neck Orson offers durability and protection from the wind.